- Your bank’s ATM will be out of service and the screen will direct you to visit the nearest one, five miles away. 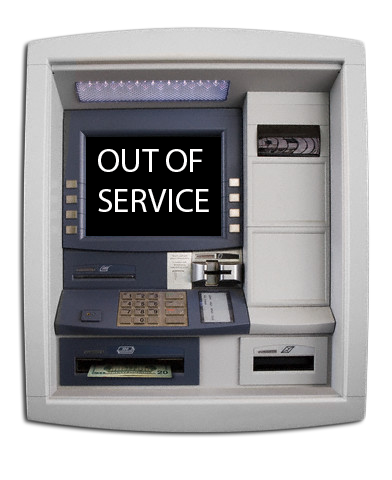 When you get to that ATM, it will be out of service and the screen will direct you to the one you originally visited. - When your car enters the car wash, the sun will be shining. By the time it emerges two minutes later, the sky will have turned gray. It will rain on the way home. The sun will come out again as you turn into your driveway. - The first time you wear a new tie, you will dribble something on it. - When you're in a hurry at the supermarket, the cashier’s printer will jam and/or run out of paper. - When you find an article of clothing or pair of shoes you want to buy, the store will have it in every size but yours. - The door prize will go to the person who entered just ahead of you. - The moment you step onto the plane, the flight attendant will announce the overhead bins are full and you have to check your bag. - When you’re waiting for an important call, Rachel from Cardmember Services will call. - When you see a story you want to read online and click on a headline, it will turn out to be a video. - Every time you are confident you’ve overpaid your taxes, you have underpaid. When you are sure you’ve underpaid, you have overpaid. - The kitchen will be out of what you ordered but your waiter won’t tell you that until he’s served everyone else in your party. - After you've waited in a phone queue for what seems like hours, listening to recorded messages telling you how important your call is, the person who finally picks up will cut you off. - In the middle of a bathroom renovation project, after the demolition but before your new cabinets, sinks, faucets, countertops, flooring, etc., have been installed, your contractor (whose references were impeccable) will (a) announce he has just been diagnosed with a terminal illness (b) declare bankruptcy after you’ve advanced him money to buy materials he hasn’t yet delivered (c) claim he is unable to give you a completion date because all of his employees suddenly decided to return to El Salvador or (d) do all the above if you’re Tom Dryden.